Achilles tendonitis or Haglund's deformity? , just to the outside of the middle of it, feels numb but also hurts at times. My heel is especially painful when the front part of my foot flexes up, and sometimes even hurts to touch the bed if I'm lying on my back. What could this be? Can a regular Internist give me a cortisone shot or do I have to see a podiatrist? This started about 9 months ago but has gotten much worse over time. Before you start asking for cortisone injections, you first need to know what the problem is. I will discuss the two most common causes of painful lumps behind the heel, even though there is always the possibility it is something else and as I state over and over again, without actually examining you, I am just guessing at your particular problem. Both of these conditions may respond to a cortisone injection but you have to be careful in how the area is injected, so your Internist is probably not your best bet; a podiatrist would be a much better choice. The first thing that comes to mind is an Achilles tendonitis. This is an inflammation of the Achilles tendon and can form a "knot" like object on the tendon. It will tend to be somewhat soft on touching it meaning it may be somewhat mushy which is important in order to differentiate it from the other possibility. If you look at the red circle on the diagram, that is where you would normally see an Achilles tendonitis specific to your complaint. An Achilles tendonitis can occur virtually any where along the course of the tendon. This can be caused by a number of issues but the two primary causes are one, constant rubbing of the back of your shoe on the Achilles tendon, particularly if you wear dress pumps or high heels quite a bit. These types of shoes tend to have a very stiff back to them and as you walk, the constant rubbing of the hard shoe against the Achilles tendon will cause it to swell and become inflamed. you flex your foot upwards and this would certainly be evident in an Achilles tendonitis. You do not mention if you are athletic or not, but that certainly comes into play. Overuse of the tendon will cause it to become inflamed, particularly if you have an equinus type foot structure. The second possibility is what is known as a Haglund's deformity. 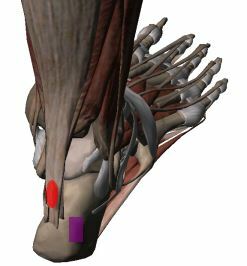 Essentially this is an enlargement of the calcaneus (heel bone) on the posterior slightly lateral aspect of the heel. This is where it seems to describe the bump. On the diagram that would correspond to the purple rectangle. Once again this is usually the result of shoe pressure, particularly dress shoes. That is why it is also known as a "pump bump". Some people have a normal predilection for this type of problem, just due to the way their heel bone is shaped. Others will develop it from years of wearing dress shoes that continually rub and irritate the back of the heel. Now, if you press this area, it should be hard because it is primarily a bone enlargement. This is different than what an Achilles tendonitis feels like. The only caveat here is sometimes you can form a bursitis over the bone swelling. This is a soft tissue cushion that the body initially forms to protect the area, but over time, the cushion (bursitis) becomes inflamed. In these instances there may be some mild redness and swelling which may make the area feel a little bit softer than hard bone when you press on it. Bending your foot upwards can cause some pain in a Haglund's deformity because when you bend your foot upwards, you essentially tighten the skin on the back of the heel and that presses into the bone. Now, assuming your problem is one of these two conditions, sometimes a cortisone injection can be helpful, however there are potential issues here. The primary issue being that poor technique in injecting an Achilles tendonitis, especially if there are more than one injection can lead to rupture of the tendon. In most cases, the approach to posterior heel pain is first for the doctor to make a proper diagnosis. Once that is made, an effort needs to be made to eliminate the causative factors, otherwise no matter what you try will probably not work. In most cases more conservative treatment is tried first for both conditions and cortisone injections are generally only introduced if the more conservative therapies are of no value. Since this issue has been going on for such a long time, you probably can assume it is not going to disappear on its own and your best bet would be to consult with a podiatrist in your area and get some proper treatment.